The Madison Freedom Fighter: Are you a South Park Republican? Update: Bill from Madison, the anti-government comment king, has his South Park character here. The talking heads have been throwing around the term "South Park Republican" for a couple of years now. What is a South Park Republican? The term "South Park Republican" has thus become popular among a handful of pundits to describe young Americans who interpret the show's values as being parallel to their cause. They see themselves as being more populist and far less puritanical than many other conservative groups (e.g. the religious right). Trey and Matt say they are extremely grateful for the 15 half-hours of airtime that Comedy Central annually affords them because it gives them a "bullhorn to yell at America." The phrase, "You know? I've learned something today..." is the trademark line, used in nearly every episode, to outline the South Park solution to the current moral crisis. South Park Republicans empathize with the characters' consideration of moral guidelines in their attempts to explain their surroundings and are extremely likely to support the "children's" decisions. Basically, it is a moderate Republican. Another article goes on to say that a South Park conservative is an average American. Half of the voting public is Republican. They watch R rated movies, enjoy a few drinks at happy hour, and even go to the occasional Wrestlemania. Hopefully, the South Park Republicans will shatter the unfair stereotype and set the record straight. As Cartman would say, That would be pretty sweet. This is a hard one for me. I do enjoy R rated movies, a few drinks at happy hour, and I love South Park. But I would not consider myself a moderate. So I'm up in the air. Are you a South Park Conservative? More importantly, what would you look like if you were a South Park Conservative character? What IS the difference between a South Park Republican and a Libertarian? Yeah, I'm a South Park Republican. There probably isn't much difference between small-l libertarians and Republicans, except how they're willing to identify. I am the ONLY (small-l) libertarian that blogs anywhere in Madison, to the best of my knowlege. You are not a libertarian anymore than the "Libertarian National Socialist Green Party" (aka NAZI PARTY) are "libertarians." If you measure the power of the state by the level of taxes, then you are not really a libertarian. Even the most radical right-wing libertarians are more concerned with executive power, with the police, with state-backed corporate monopoloy, and with war than they are with cutting taxes a few percentages. The IRS is a militarized police agency, for crying out loud. It wouldn't matter how high congress set the tax rate, if the IRS had no teeth, no one would bother paying their taxes anyways. 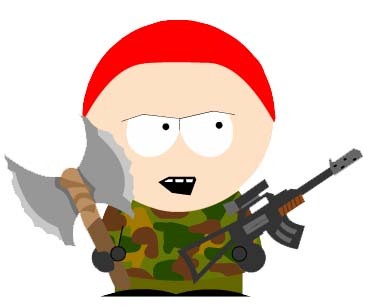 I posted my South Park character at www.hawken.blogspot.com. Check it out. Nice! Looks just like you! How do you propose society functions without people paying taxes? How do businesses operate? What happens if someone signs a contract and chooses not to fulfil his obligations? How do you buy your computer? How do you pay for it? Who puts together the computer? Who develops the chips? Who will risk 10-20 years of R&D with the risk of never developing a useful product? (GM and Ford have huge R&D facilities where people spend much of their lives doing research on products that never get developed). Why would anyone take this risk in a system without money, corporations, or business? You cannot rail against corporate "monopolies" without offering an alternative.